Helping you find solutions for all of your personal and important legal issues, the attorneys at the Goodwin Como, P.C., law firm in Uniontown, Pennsylvania, provide exceptional representation in the areas that matter most to you and your family. 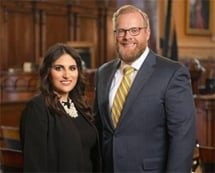 Our attorneys, Benjamin F. Goodwin and Amanda M. Como, each possesses extensive experience in a variety of practice areas, and both are fully committed to serving the members of our community by delivering the personalized assistance and compassionate counsel our clients deserve. As evidence of our success, we have received numerous awards and honors for our professionalism and service. Along with our perfect client ratings on Avvo, we have earned recognition as the region's top attorneys by various peer review sources such as the American Institute of Family Law Attorneys, the National Association of Personal Injury Attorneys and the American Society of Legal Advocates, just to name a few. This means you can expect to receive reliable, competent counsel from a local attorney you can trust with your most sensitive legal issues, and we are prepared to do whatever is necessary to ensure you obtain the most favorable outcome possible for your situation. To find out more about how Goodwin Como, P.C., can best serve your needs, you can contact our law office to schedule a free initial consultation.